A Wolf-Rayet star is an old massive star on its way to becoming a supernova. They are distinguished by extremely strong stellar winds and their spectral lines tend to show they are rich in helium, but don’t contain much hydrogen. It’s generally been thought that the lack of hydrogen in Wolf-Rayet stars is due to the strong solar winds pushing away the light element, but a new paper in MNRAS finds evidence of an alternative method, which is the capture of hydrogen by a companion star. The paper looks at a star known as NaSt1, since it was discovered in 1963 by Jason Nassau and Charles Stephenson. As a result it’s been given the nickname “Nasty 1.” When the team measured the speed of the outer layers of the star, they found it was moving much more slowly than outer layers of other dying stars, such as Eta Carinae. In fact the speed is too slow to cause hydrogen to escape from the star, so the solar wind idea doesn’t work in this case. 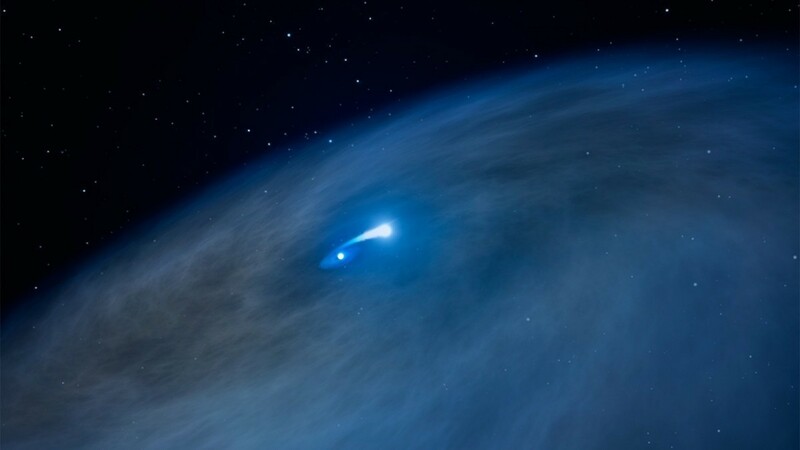 But this star also has a binary companion, which could capture the hydrogen of the Wolf-Rayet star. The basic idea is that as the Wolf-Rayet star reached the end of its life it swelled significantly. Most of the outer layer of the star would be hydrogen, since it is lighter than other elements. The companion star could then capture the outer hydrogen envelope, stripping the Wolf-Rayet star of hydrogen. Since about 70% of large stars are part of a binary system, this could be a common way for Wolf-Rayet stars to form. What’s fascinating about this discovery is the fact that a binary system like this isn’t particularly stable on an astronomical time scale, so it’s a pretty rare find. The two stars could soon merge, triggering a supernova explosion, or the capture of hydrogen by the companion may trigger an x-ray burst. Either way, things are going to get pretty interesting for these stars in the near future.